Despite being Britain's leading manufacturers of garage doors for many years, Henderson Garage Doors are not currently in production or on-sale in the UK. However, at Arridge Garage Doors we stock a range of similar products. Henderson Garage Doors was Britain's main garage door manufacturer. Henderson is almost a household name like Velux or Dyson. The only Henderson doors available in the U.K. up until early 2013 was the Henderson G60 sectional garage door, imported by a Midlands-based roller door manufacturer and sold as the Premier G60 at discount prices by Arridge Garage Doors. In 2013, this importer ceased trading so even the very high quality and highly insulated Henderson G60 sectional garage door is sadly no longer available in the UK. 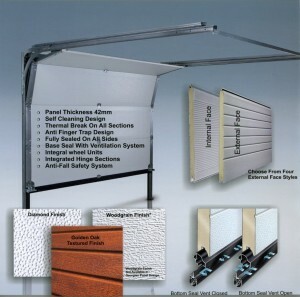 All other Henderson garage doors have not been available in the U.K since Spring 2010. The Henderson G60 was made in Sweden by the Cardo Group, a huge multi-national, who still own the Henderson trade mark and who invested heavily in Henderson U.K. up until 2009, when it decided to withdraw from the U.K. garage door market. The state-of-the-art automated production facility in Bowburn, County Durham is mothballed until further notice. Hormann sectional garage doors and Carteck sectional doors are the equivalent to the famous Henderson G60, and our range of powdercoated steel garage doors might even be superior to the former range of Henderson up and over doors. Though no longer manufactured, over a million Henderson Garage Doors are still installed at UK properties, with spare cables, springs and locks occasionally being required. Our Henderson garage door spares section has all these listed with clear photos, descriptions, prices and easy online ordering. The popular Henderson Duo, Sprint and Marathon electric garage door openers are still available from us at discounted prices. Some Henderson spares are still available.